Foaming Lavish is a high-quality liquid soap that cleans soiled hands fast and complete. White in color and with a pleasant, cherry scent, this hand soap has luxurious foaming properties and can be used in any bulk foaming soap dispenser. 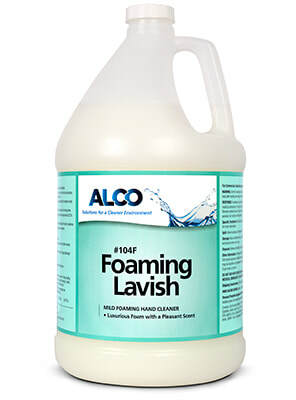 Foaming Lavish provides the end user with a safe, effective and economical foaming lotion hand soap which can be utilized in institutional and industrial applications. Use this with the 9326 Bulk Fill Foaming Soap Dispenser (holds 1000ml).